The olecranon is the point of the elbow, right next to your funny bone (which, by the way, is not funny and is not a bone). You can easily feel it by bending your elbow and find the tip in the back right under the skin. The olecranon is the part of the ulna bone. It can easily break if you experience a direct blow or fall directly on a bent elbow. Olcranon fractures are common. They can be a part of a more complex elbow injury. 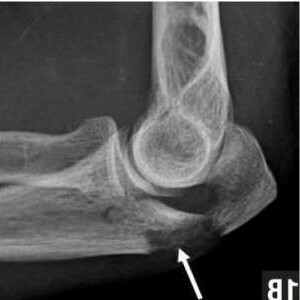 A patient with an olecranon fracture will typically go to the emergency room because the elbow will be very painful and difficult to move. X-rays will be taken of the elbow to confirm that a fracture has occurred and show other fractures or dislocations. It will also help decide whether the fracture requires surgical repair. If the fracture has not separated, meaning there is no gap between the two main pieces, then surgery may not be necessary. It is really important, thought, to give it time to heal without separation. This usually requires a splint or cast to hold the elbow in place during the healing process. X-rays will be taken often to check healing and make sure the pieces stay together. If the fracture is separated( displaced) or shifts in place during the healing process, then surgery maybe considered as the two ends may not be able to heal together. The goal of surgery is to bring the two pieces together in their natural alignment ( anatomic alignment), and secure them in place using a variety of devices such as pins, plates and screws.